"Read, study and spread the word of Allah." • No Ads Banner on top or bottom of the screen! Its only have an Interstitial Ads. • All Free, it is 100% free to download and to use. There is also NO in-app purchase. • Auto-scrolling in a single page permits continuous reading through the entire chapter without having to flip a page or touching the screen. • Full-Screen mode is available. • Bookmarks can be placed at any place. 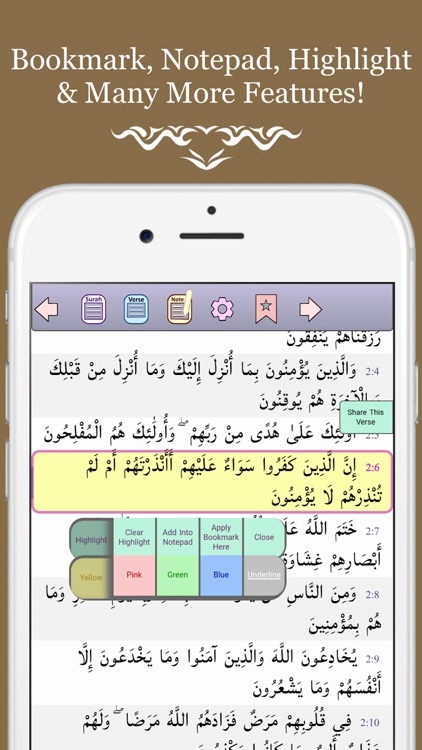 • Notepad: one click on any verse number to copy and paste that verse into the notepad. • Notes can be saved and transferred. • Highlight: 4 different shades and 3 different levels of intensity to choose from. 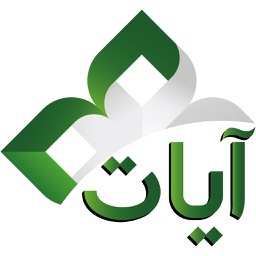 • There are 7 different Arabic fonts. • Big Fonts are available! Easy to see huge fonts. • Feel free to adjust the font size, word spacing, line height, background color, and page margins for optimal reading. • 3 verse layout modes. • Resume button that allows you to resume where you last left off. • Quick and easy navigation thanks to intuitive and organized navigation. 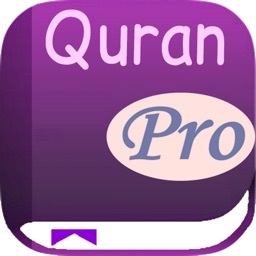 • This app is the easiest Quran's book reader. • Landscape or portrait orientation available. The Holy Quran القرآن الكريم is a compilation of the verbal revelations given to the Holy Prophet Muhammad (saw) over a period of twenty three years. 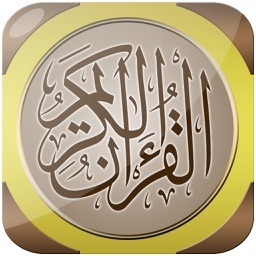 The Holy Quran القرآن الكريم is the Holy Book or the Scriptures of the Muslims. It lays down for them the law and commandments, codes for their social and moral behaviour, and contains a comprehensive religious philosophy. 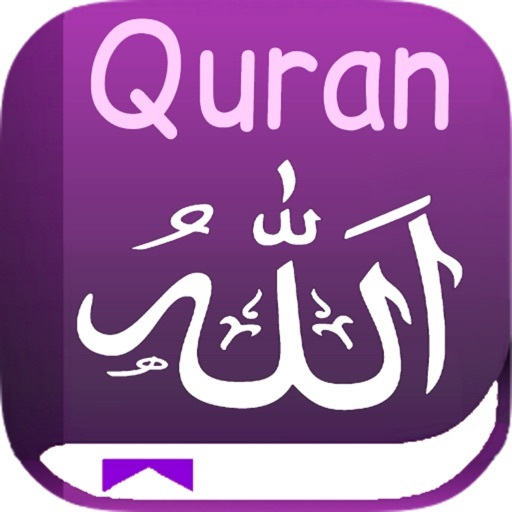 The Quran (Arabic: القرآن‎‎ al-Qur'an, literally meaning "the recitation"; also romanized Qur'an or Koran) is the central religious text of Islam, which Muslims believe to be a revelation from God (Allah). It is widely regarded as the finest work in classical Arabic literature. 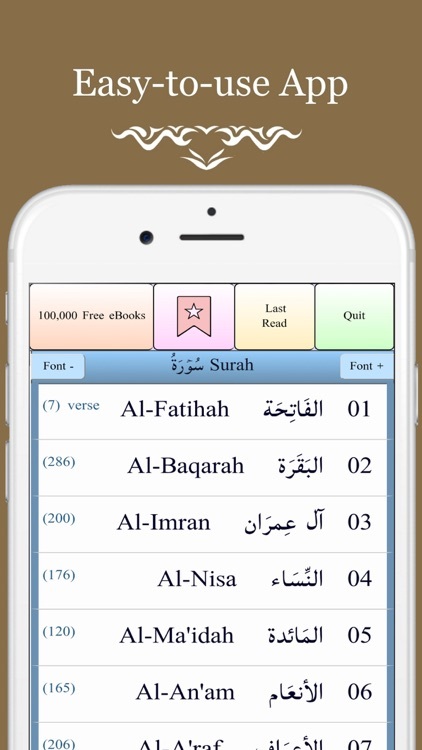 The Quran is divided into chapters (surah in Arabic), which are then divided into verses (ayah). Muslims believe that the Quran was verbally revealed by God to Muhammad through the angel Gabriel (Jibril), gradually over a period of approximately 23 years, beginning on 22 December 609 CE, when Muhammad was 40, and concluding in 632, the year of his death. Muslims regard the Quran as the most important miracle of Muhammad, a proof of his prophethood. Thank you for using AL-QURAN.